1. The Army must complete consultation and the Section 106 process to comply with the NHPA. An agency must determine whether its undertaking has the potential to cause effects on historic properties. Animals can be protected under the NHPA. If an undertaking has the potential to cause effects on historic properties, an agency must undergo the section 106 process. Agencies may coordinate compliance with section 106 and requirements of NEPA, but the Army did not do this. The Army failed to consult as required under the NHPA’s section 106 process. The Army’s claim that it was not required to undergo the Section 106 consultation process lacks merit. NEPA requires federal agencies to prepare an EIS before undertaking any “major federal action” significantly affecting the quality of the human environment. Under Army and CEQ regulations, an EA must contain certain elements. The Army violated NEPA by failing to conduct an EIS. 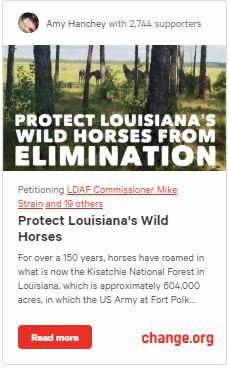 The Army’s approval of COA7 constitutes a “major federal action” under the statute.The Army must complete an EIS, because its horse elimination plan is a major federal action significantly affecting the environment. The Army’s own regulations require that an EIS be conducted before deciding on a plan to manage horses at Fort Polk. The Army’s EA is inadequate. The Army failed to include required elements of an EA. The Army had already made up its mind before it even started the NEPA process. During this same brief the Army stated, “The Senior Commander has determined the need to eliminate trespass horses on the training area.” JRTC-G-000115. This fundamentally violates NEPA, which mandates that the government keep an open mind until it has evaluated the evidence and the alternatives. As such, the Army needs take a moment, step back, and take an honest hard look at the question of how best to manage the wild and free-roaming horses at Fort Polk. 3. Extra record evidence may be admitted to determine whether the Army adequately considered potential impacts of its Horse Elimination Plan.